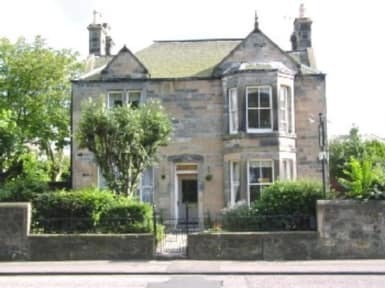 Aynetree Guest House kohteessa Edinburgh, Skotlanti: Varaa nyt! Although central to all attractions including Arthur's Seat and the Palace of Holyrood; the house is peaceful, quiet and relaxing, and overlooking parkland. For your comfort, we offer 5 fully equipped en-suite bedrooms and one double bedroom which has a private spacious bathroom. Basic - Petite double room with traditional wooden floor. Shower, toilet and wash hand basin en-suite. 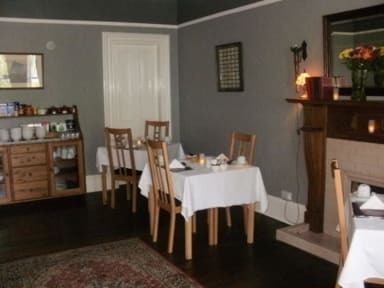 Standard - Double room with original stone fireplace and large private bathroom accessed down a few stairs (not en-suite) with hand-held shower, bath, toilet and wash hand basin. Delux - Double room with shower, toilet and wash hand basin en-suite. All bedrooms have controllable central heating, complimentary toiletries, hair dryer, radio alarm clock, remote control colour TV, hospitality tray with tea/coffee making facilities. Guests can always be certain of personal attention. Guests may leave their car/luggage from 10.00am. Arrivals after 8.00pm must notify the guest house. To fuel guests for their day of exploring, we offer a full traditional Scottish breakfast, or vegetarian option, or a full continental breakfast. Guests with special diets are also catered for on prior notification. Edinburgh's excellent and convenient public bus service gives quick and easy access to the other parts of the city with a direct bus to the city centre from the bus stop right outside the house. Children over the age of 3 are most welcome in our family home. If you cancel your booking 7 days or less of advance of your arrival; or you fail to arrive, then all of the accommodation cost shall be deducted from your credit card. If you cancel your booking over 7 days, but up to 14 days of advance of your arrival; then the first night's accommodation shall be deducted from your credit card. If you cancel your booking over 14 days of advance of your arrival then any money debited from your credit card shall be refunded.